The Kitchens were always located near the Refectory and the Prior's lodging, because because it was necessary to get food to both places quickly, while it still remained hot. Equally, it was normally a separate building because of the risk of fire. 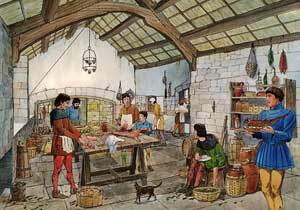 The above sketch is a reconstruction from Skipton Castle, and the priory would have a similar sized kitchen, because food would have to be prepared for the prior, the monks and their guests, and a number of people employed by the priory who had food in lieu of wages. The cellarer was responsible for providing the food for the kitchen, and his office was close by. The priory owned a number of manors as well as the tithes of a large number of churches. After the Black Death of 1349, labour became much more scarce, and instead of giving customary labour in exchange for land or houses to their lords, people became wage earners. Many monasteries, rather than take the risk of bad harvests and heavy wage bills, began to rent their farms out. Cash was not by any means the only form of currency, and produce in kind was normally taken from tenants as rent. Such produce as grain was stored in barns within the priory walls, and some fresh fish and salt herring (by the barrel) would be brought from the coastal ports of Salthouse and the Glaven ports (Blakeney, Cley and Wiveton); game and chickens would come from other estates. The herbs which the kitchen used would be grown in the Cloister garth, and normally priories had their own orchards so that fresh fruit would be available in season. 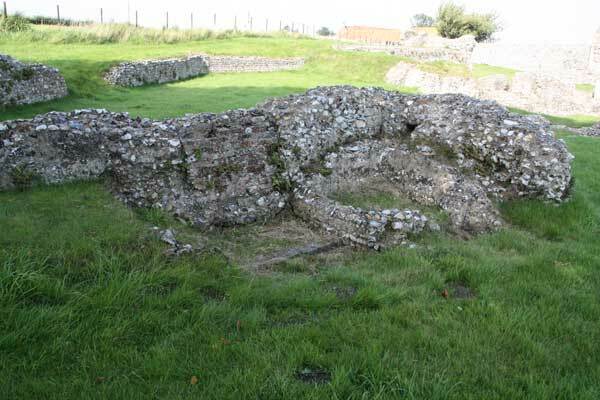 The priory also had fish ponds for fresh-water fish, such as carp and trout, and these were located in the north-west part of the monastic enclosure. Spices and other delicacies would be bought from local fairs. For the monks' diet see under Refectory.